Drone Graffiti Project launched at Mexico City street art fair » UAV DACH e.V. Among the more unconventional uses of drones is an ability that enables graffiti artists to reach places never before possible. This capability was demonstrated earlier this month when the Drone Graffiti Project was launched during Mexico City’s Art Week, one of the top street art festivals in Latin America. Building the hardware and software needed for the innovative project were Aternity Blockchain, Voliro AG, SPH Engineering, DroneMasters and Mexico-based urban art organization All City Canvas. This technology enabled drones to spray art on the walls in Roma Norte during the Mexico City art fair. Among those selected to work with drone graffiti are U.S. artist Tom Edwards, whose work has been seen on the screen of Tesla automobiles and is considered a symbol for artists rights in the digital age. Blockchain can produce a verifiable digital identity for urban art that can be retained for eternity. All relevant information related to a piece of artwork can be made easily accessible, helping to put an end to the risks of fraud and offering an opportunity for street art become more valuable in the future. Drone graffiti is considered an emerging creative medium which embodies the ethos of urban art while offering fresh means of expression in places normally physically out of reach for artists. How long street art lasts is a race against the clock before building walls are ripped down or murals are painted over. Aternity Blockchain provides a means to permanently preserve the artwork and make it accessible to a global audience. 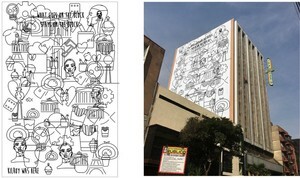 Beitrag im Original auf http://uasmagazine.com/articles/1987/drone-graffiti-project-launched-at-mexico-city-street-art-fair, mit freundlicher Genehmigung von The UAS Magazine automatisch importiert. Original in englischer Sprache. Der Beitrag gibt nicht unbedingt die Meinung von UAV DACH e.V. wieder.